‘My throat is hurting.’ Smoke has soiled Utah’s air, causing everyone from outdoor lovers to BYU football to Tour of Utah riders to adjust. (Francisco Kjolseth | The Salt Lake Tribune) Dakota Nielsen, an apprentice lineman for Rocky Mountain Power, wears a mask while working on replacement power poles burned down along U.S. Highway 6 in the Coal Hollow Fire on Saturday, Aug. 11, 2018. Occasionally, he can see the ash falling. "The less stuff in my lungs the better," Nielsen said. "It's been really bad." The visit to Moab last Sunday was fantastic. There were clear blue skies and sunshine that beamed off the red rocks. Then the Gomar family, from Alvin, Texas, drove to Springville to visit family. They saw flames as they drove west on U.S. Highway 6. In Springville, the air was so bad they canceled plans to go hiking, fishing and cycling. Pablo Gomar, 31, and his wife made their two kids, ages 5 and 7, wear masks when they did go outside. “With small children and their immune system, it was, like, maybe we shouldn’t do all these outdoor things,” Gomar said. Wildfires have grayed Utah’s skies at the peak of the state’s summer outdoor season. Over the last week, everyone from recreational hikers and bikers to world-class athletes have changed plans or lodged complaints. 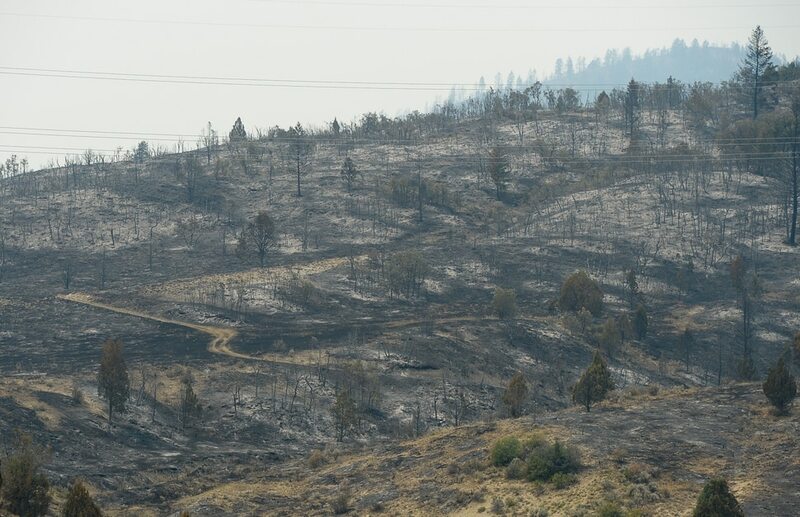 (Francisco Kjolseth | The Salt Lake Tribune) A charred landscape remains as crews continue to battle the Coal Hollow Fire near Highway 6 on Saturday, Aug. 11, 2018. 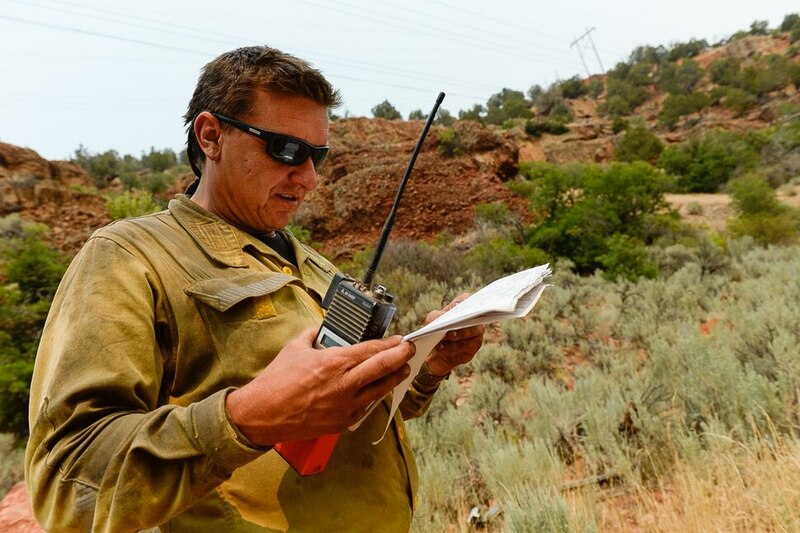 (Francisco Kjolseth | The Salt Lake Tribune) Kenney Bochniak, Assistant Super Independent for Snake River Hotshots coordinates water drops while working the Coal Hollow Fire along Highway 6 in Utah County on Saturday, Aug. 11, 2018. 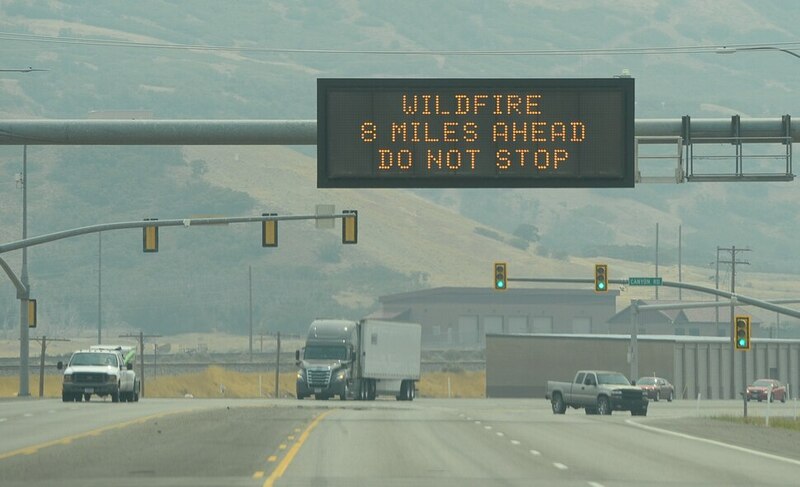 (Francisco Kjolseth | The Salt Lake Tribune) Signs warn motorists of the Coal Hollow Fire burning along Highway 6 in Utah County, Saturday Aug. 11, 2018. (Francisco Kjolseth | The Salt Lake Tribune) Dakota Nielsen, an apprentice lineman for Rocky Mountain Power, wears a mask while working on replacement power poles burned down along U.S. Highway 6 in the Coal Hollow Fire on Saturday, Aug. 11, 2018. Occasionally, he can see the ash falling. The less stuff in my lungs the better, Nielsen said. It's been really bad. (Francisco Kjolseth | The Salt Lake Tribune) Crews continue to battle the Coal Hollow Fire near Highway 6 on Saturday, Aug. 11, 2018. (Francisco Kjolseth | The Salt Lake Tribune) Crews continue to battle the Coal Hollow Fire near Highway 6 on Saturday, Aug. 11, 2018. (Francisco Kjolseth | The Salt Lake Tribune) An abundance of dry fuel makes for dangerous conditions as Mount Timpanogos stands higher than the rest with thick smoke enveloping the mountains in Utah County contributing to poor air quality as crews continue to battle the Coal Hollow Fire near Highway 6, Saturday Aug. 11, 2018. 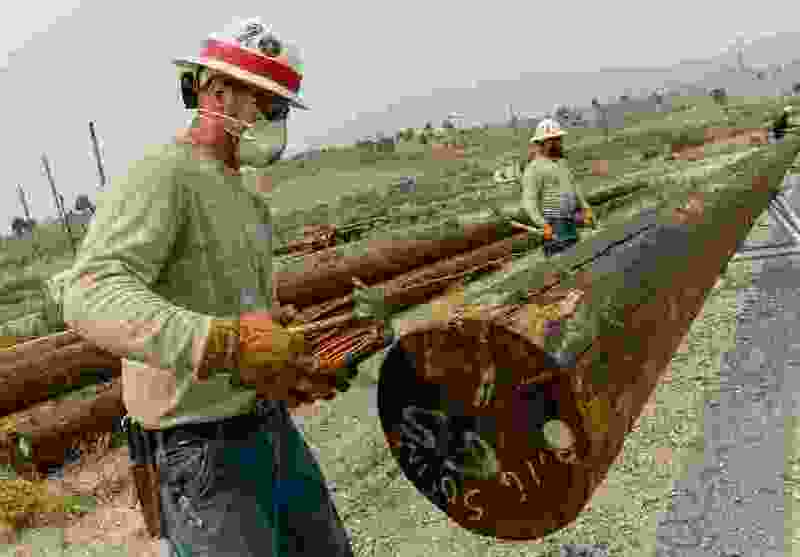 (Francisco Kjolseth | The Salt Lake Tribune) Rocky Mountain Power replaces power poles burned down by the Coal Hollow Fire near Highway 6 on Saturday, Aug. 11, 2018. (Francisco Kjolseth | The Salt Lake Tribune) Thick smoke envelops the mountains and Utah County with poor air quality as crews continue to battle the Coal Hollow fire near Highway 6 on Saturday, Aug. 11, 2018. (Francisco Kjolseth | The Salt Lake Tribune) Thick smoke envelopes Spanish Fork Canyon as crews continue to battle the Coal Hollow Fire near Highway 6 on Saturday, Aug. 11, 2018. (Francisco Kjolseth | The Salt Lake Tribune) Crews continue to battle the Coal Hollow Fire near Highway 6 on Saturday, Aug. 11, 2018. (Francisco Kjolseth | The Salt Lake Tribune) Crews continue to battle the Coal Hollow Fire near Highway 6 on Saturday, Aug. 11, 2018. (Francisco Kjolseth | The Salt Lake Tribune) Crews continue to battle the Coal Hollow Fire near Highway 6 on Saturday, Aug. 11, 2018. (Francisco Kjolseth | The Salt Lake Tribune) Mount Timpanogos stands higher than the rest as thick smoke envelops the mountains and Utah county with poor air quality as crews continue to battle the Coal Hollow fire near Highway 6 on Saturday, Aug. 11, 2018. "My throat is hurting,” he said after the stage. The air has been worst in Utah County, where the Coal Hollow Fire ignited Monday in Spanish Fork Canyon. Like all of the state, Utah County also is catching smoke from wildfires in California. Golfers rode in carts Thursday in the final round of the Utah Women's Open at East Bay Golf Course in Provo. Ordinarily, many of them would have been walking. Also in Provo, Brigham Young University football coach Kalani Sitake adjusted his team’s practice schedule to reduce players’ time outdoors. In Spanish Fork, a movie screening in a city park and a Spanish Fork High School football scrimmage were canceled. At Provo Pioneer Village, summer Saturdays usually mean a steady stream of visitors — about 75 people on average, estimates Alex Quinn, a volunteer there. On this Saturday, Quinn said, only about 10 had arrived by noon. “I’ve mainly been sitting around waiting for people, who I’m fairly certain aren’t coming due to the poor air quality,” Quinn wrote in an email to The Tribune. He didn’t blame people for staying away. “My throat has been sore all morning,” Quinn wrote. (Nate Carlisle | The Salt Lake Tribune) Looking east from downtown Salt Lake City, air pollution, much of it from wildfire smoke, obscures a view of the Wasatch Mountains on Aug. 6, 2018. The air in Salt Lake, Davis, Weber and Utah counties remained “unhealthy for sensitive groups” on Saturday, according to the Utah Division of Air Quality. The division’s forecasts called for the air to remain unhealthy through at least Tuesday. Jess Gomez, a spokesman for Intermountain Healthcare, said in the past 10 days the hospital and clinic system has “seen a significant increase in the number of people who are seeing their primary care physician or coming into our InstaCare or emergency departments” with symptoms associated with poor air quality. Workers have made changes, too. Dakota Nielsen, an apprentice lineman for Rocky Mountain Power, wears a mask while working on replacement power poles along Highway 6 where the Coal Hollow Fire burnt. Occasionally, he can see the ash falling. Anyone looking up at a mountain along the Wasatch Front, or down from a mountain overlook, can see a haze. Jay Drew, Paighten Harkins, Francisco Kjolseth, Kurt Kragthorpe and Gordon Monson contributed to this report. Correction at 12:34 a.m. on Aug. 12, 2018: An earlier version of this story and accompanying photo incorrectly identified the lineman from Rocky Mountain Power.